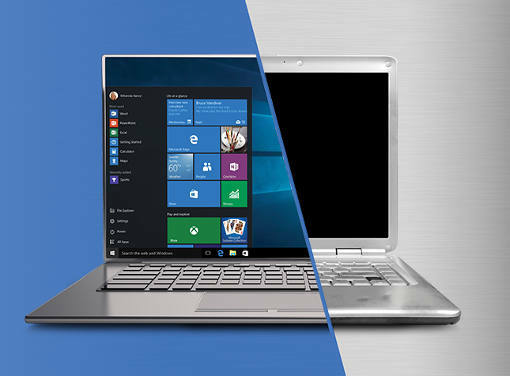 If you're planning to buy a new Windows 10 laptop, Microsoft's Easy Trade Up promotion can earn you up to $200 when you trade in your old Windows laptop or up to $300 for your old Mac. The rebate applies when you buy a qualifying Windows 10 laptop for at least $599 from a U.S. Microsoft store during the promotion running through Oct. 20. Among the eligible products are laptops made by Acer, Asus, Dell, HP, Lenovo, MSI, Razer, Samsung, Sony and Toshiba. For a list of the specific models, visit the list of qualifying purchases on Microsoft's Easy Trade Up website. Eligible trade-ins include the Apple MacBook or Apple iMac or all-in-one devices, laptops or 2-in-1s running any operating system. The device must be functional and undamaged with a working battery and power supply. Laptops should be no more than six years old and must have a screen size of at least 11.3 inches. Don't worry much about minor scratches or normal wear and tear; these won't disqualify your Mac or laptop for trade in. Peripherals such as external monitors, keyboards and mice are not eligible trade-in items. According to Microsoft's Easy Trade Up website, you can get your reward or rebate in a few steps. First, buy the qualifying product and make sure to keep your receipts. Next, send a trade-in claim through the Easy Trade Up website within two weeks of purchase. You'll need to send details about your purchase such as the date and place of purchase, product manufacturer and model, serial number, a photo of the item's box showing the part number and operating system, proof of purchase and personal and payment details. Once your claim is approved, ship your qualifying trade-in device to Microsoft. Make sure that Microsoft gets it within 30 days of your purchase of the qualifying product. Microsoft will validate and test the device that you sent. Your payment should be processed within 28 days of validating your claim. To monitor your claim, you can use the Claim Tracker on the Easy Trade Up website. Have an old computer and don't know what to do with it? See our post on how to get rid of your old computer. I know that Microsoft has done this in the past as well, but to me it seems like a desperate move. And what’s even more, is that you get more for a Mac than a Windows PC. It’s like saying that Mac’s are better and worth more. $300 for your for my old Mac. I have a mid-2012 model MacBook Pro without retina display. I wonder how much will I get back. This sounds like easy process though. I have a MacBook (Air).And It takes almost $899. As it happens that windows really offering this!! But I’m pretty comfortable to use the macbook.Thanks,for sharing the news! !